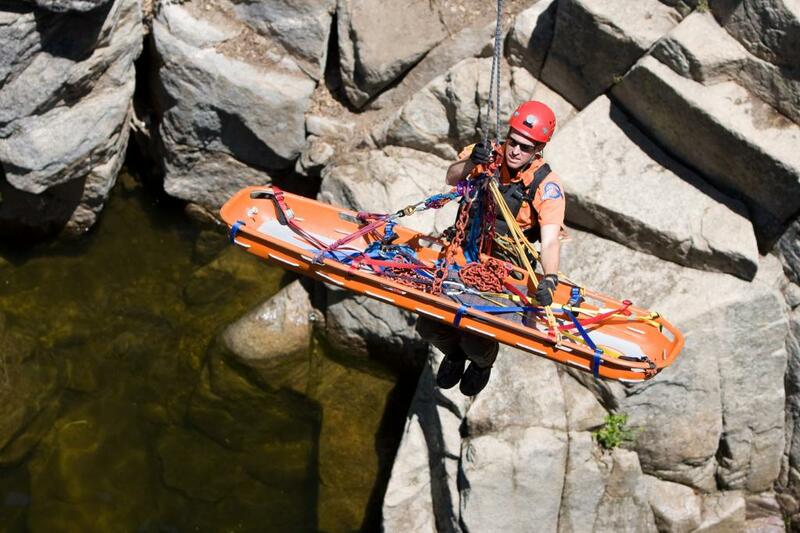 Two weeks ago my Search and Rescue team practiced a highly complicated technique known as a highline during our training at Deep Creek. Basically a highline is a rope across a canyon on which a litter and attendant can move both vertically and horizontally. We started the day by lugging the huge amount of gear a highline requires to our destination. This gear included over a thousand feet of rope, over 50 pounds of hardware, rock protection, webbing, the litter and our personal packs. This training was different from our usual highline training because one of our teammates was shooting photos on rope. We rigged a separate system for him about 10 feet above the highline so he could get a good angle. The first part of rigging the highline was getting the rope across the gap. To do this we employed a giant slingshot that we used to launch a little buckshot filled bag. The bag is connected to a high strength kevlar thread. Once this is across we attached it to a heave line which we attached to the thread. We then reeled it back in using fishing pole. That line was then attached to the ropes which we sent back and attached to an anchor. Once we had the track line rigged we rigged another line through a pulley at the far anchor. Then brought it back to a very large pulley called a kootenay which is where the litter hung from. This line was used to pull the litter out away from the haul team. Another line was attached to the other side of the kootenay to pull it back towards the haul team. Finally one very long line was connected through the kootenay and down to the litter on a pulley. This line was the reave line and was be used to raise and lower the litter. As you can probably tell this was a complicated system. It saw strength levels not normally seen in a standard rescue system so certain special features like high-strength tie-offs were used. High strength tie-offs use two prussiks (basically loops or rope wrapped around a larger rope) to increase the strength of anchor point tie ins. Running the system was also non-trivial as the haul team had to respond to commands other than just up down and stop. They also had to to move the patient and attendant horizontally. At the end of the day we actually did a great job of rigging everything and got set up in a reasonable amount of time. Especially considering that we also needed to rig a separate system for our photographer.